A special power of attorney is a legal document written by the so-called 'Principal' that details the specified and specific wishes and directions for an 'Agent', 'Attorney-in-fact' or 'Attorney' to carry out. Depending on the amount of authority you give to your attorney-in-fact, a power of attorney can be classified as a General Power of Attorney or a Special Power of Attorney. A Special Power of Attorney is drawn up to give your the attorney-in-fact authority to handle a particular task that is often limited in scope. For example, a specific power such as selling a piece of property, selling an automobile, closing a bank account at a financial institution, filing your tax returns, running your business while you are away on vacation, etc. A Durable Power of Attorney remains effective even after if you become incapacitated. Unless a power of attorney is durable, it will become void when you become incapacitated or when you are officially declared incompetent. What distinguishes a General Power of Attorney from a Special Power of Attorney is the amount of legal authority granted to the attorney-in-fact. A typical unlimited General Power of Attorney grants the attorney-in-fact the authority to make financial, legal, medical, and business decisions on behalf of the principal. Essentially, the attorney-in fact is granted the legal power of the principal's signature in all matters, as well as, access to information that would otherwise only be accessible by the principal. A Will is an estate planning document that is concerned with the deposition of your estate after you die, such as passing your assets on to your family members. A power of attorney is a lifetime document that is concerned with giving someone else the legal authority to act on your behalf in businesses, financial, personal and/or medical matters while you are alive and can't act for yourself. A power of attorney is automatically revoked when you die. Thus, neither a Will nor a Power of Attorney is a substitute for the other. Can Special and General Powers of Attorney be Made Durable? Yes. You can add a durability clause to create an enduring power of attorney in both a Special and General Power of Attorney. What's more, you can create what is referred to as a Springing Power of Attorney by specifying that the power of attorney only becomes effective if and when you become incapacitated. 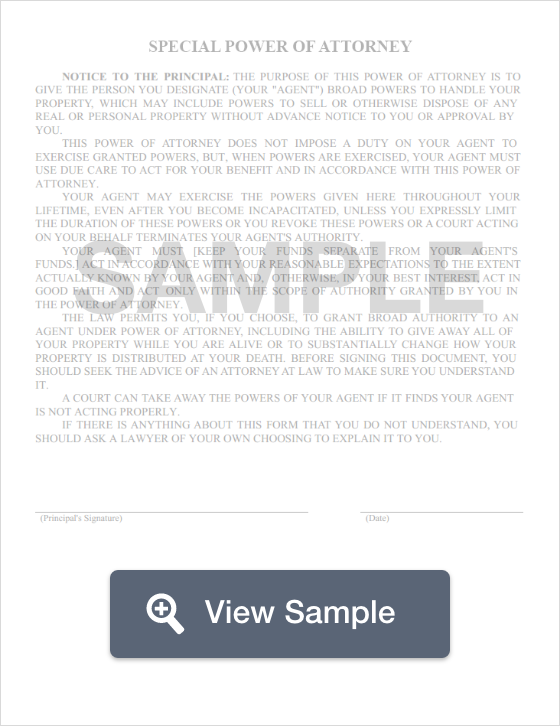 Create a free Special Power of Attorney in minutes with our professional document builder. Who Needs a Special Power of Attorney? Anyone who is over 18 and who anticipates circumstances where they will need someone else to act on their behalf, perhaps due to absence or incapacity. Anyone who anticipates having to handle someone else's affairs for a specific purpose or length of time. What Can You Use A Special Power of Attorney For? Step 1 - list the name and addresses of the principal. If you are looking to authorize someone to act on your own behalf, then this would be you. Step 2 - list the name and address of the party who you want to act on your behalf. Please note that is can be more than one person. If you designate more than one person as your agent or attorney-in-fact, you can have them work, jointly, separately, or alternately, in the order you wish. Step 3 - state the powers you are granting to your attorney-in-fact and give special instructions limiting what he or she can do on your behalf. Step 4 - designate when the power of attorney will become effective and the length of time the power of attorney will remain in effect. 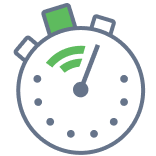 It can start immediately and remain in effect until you specifically cancel it or it can remain effective for a specified period of time. Alternatively, it can begin only if you become incapacitated and unable to handle your own affairs, or you can elect to allow the power of attorney to terminate if you become incapacitated––you can also designate who will make that determination. Step 5 - Acknowledge the execution of this power of attorney and sign it. Step 6 - provide the signatures of two individuals who witnessed you sign the document. These individuals must both be at least 18 years of age and neither can be named in the document as an attorney-in-fact. Step 7 - Another option is to have your signature witnessed by a notary public. Once your Special Power of Attorney had been completed, you should provide copies of it to those who will be carrying our your wishes. A Special Power of Attorney is a legal document that grants your agent or attorney-in-fact the authority to act on your behalf under certain, specified circumstances as outlined in the document. Since the agent or attorney-in-fact that you name in your special power of attorney will have the legal authority to act on your behalf in the circumstances specified in the document, you should be sure that you can trust this person to act in your best interests. It is important to keep in mind that you still maintain the right to act on your own behalf. You can revoke the Special Power of Attorney whenever you see fit. In this way, you will be taking away all of the authority that was granted by the document to the person that it names as your attorney-in-fact. Many believe that you only need a power of attorney when you are elderly. However, unexpected life events can happen at any age and if a power of attorney has not been put in place, your loved ones may have to go through the expensive and time-consuming legal process of seeking a conservatorship to handle your affairs. This is made all the more undesirable due to the fact that neither you nor your family will have any control over who the court appoints to handle your affairs. Anyone over 18 can create multiple special powers of attorney, authorizing different people or agencies to act on their behalf under each separate document. The laws and requirements for creating a valid power of attorney are governed by the state in which you live. These laws vary from state to state. This is not generally necessary. However, where the sale and purchase of real estate is concerned, this must be recorded in the county real estate records. No. A power of attorney is only active and effective as long as you (the principal) are alive. A non-disclosure agreement is extremely important to a business. Once signed, it legally prevents the other party from revealing company secrets. An affidavit is a written statement that is confirmed either by an oath or an affirmation within the document. Affidavits are commonly used in legal disputes. A release of liability offers protections to businesses where customers can sustain injury, such as extreme sports facilities providers. It means that customers enjoy activities at their own risk.